Think green tea is only for the yogis and health nuts? 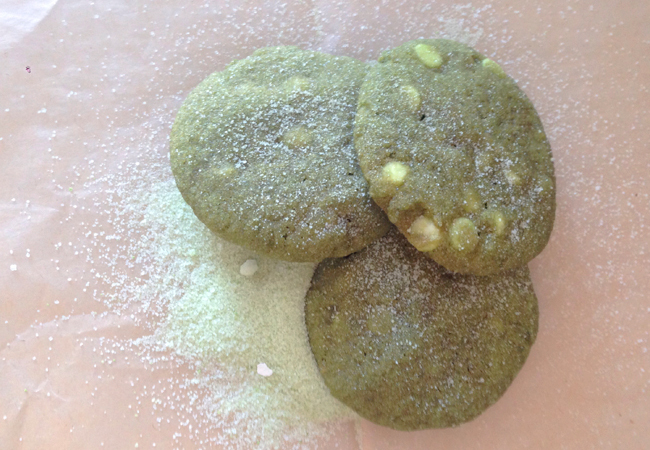 Think again with this genius Bon Appetit recipe for green tea powder cookies laced with white chocolate chunks. How amazing is that festive color? 1. Whisk ½ cup granulated sugar and ½ teaspoon matcha in a small bowl; set aside. 2. Whisk flour, baking soda, salt, and remaining 2 tablespoons matcha in a medium bowl. 3. Using an electric mixer on medium-high speed, beat butter, brown sugar, honey, and remaining ¼ cup granulated sugar in a medium bowl until light and fluffy, about 4 minutes. Add egg, egg yolk, and lemon zest and mix until very pale, about 4 minutes. 4. Reduce mixer speed to low and, with motor running, add flour mixture; mix until no dry spots remain. Using a wooden spoon or rubber spatula, mix in white chocolate. 5. Wrap dough in plastic and chill at least 2 hours and up to 5 days. If chilling more than a few hours, let dough sit at room temperature 1 hour to soften before scooping and baking. 7. Bake cookies, rotating baking sheet halfway through, until bottoms and edges are barely golden and cooked (top will no longer look wet), 8–10 minutes. 8. Immediately—but gently—toss cookies in reserved matcha sugar and place on wire racks; let cool. *Can store cookies airtight at room temperature up to 2 days.